Learning Objectives Est. time: 8 min. How should you begin a negotiation? You could engage in small talk. You might paint a big picture overview of your objectives and ask your counterpart to describe their general interests. Or you might get right down to business and make an offer - or ask for one. What you do may depend on your circumstances, your expectations about your counterpart, and your general approach to negotiation. At some point, though, someone has to put a serious proposal on the table. In his book, Dell shares behind-the-scenes stories of his dealings with some of the most powerful sports owners and executives. Sports agent and promoter Donald Dell is the author of an entertaining and informative negotiation book called Never Make the First Offer (Except When You Should). His title is tongue in cheek—but also spot on: sometimes it’s smart to work from your own number; other times it’s better to wait to see what your counterpart is prepared to offer. Dell shares behind the scenes stories of his dealings with powerful team owners and television executives to explain how he makes that choice. Conventional wisdom says to avoid making the first offer. And it’s easy to find real world examples of where that can pay off. If you’re patient and lucky, you may end up with more than you ever imagined. Jack Binion, a celebrated Las Vegas casino operator, tells of an old Mississippi family that owned some prime farmland that another resort developer was trying to buy. In planning their strategy, one of them said, “Let’s ask five million for our property.” Others in the family worried that the high number could turn off the prospective buyer, but they agreed to give it a try. Fortunately for them, the developer started first. “We’ve thought this over,” he said, “and our bottom line is twenty million.” After the siblings caught their breath, they said they’d have to confer privately. When they returned, they were able to bump up the final figure to $25 million! See: “Judgment and Uncertainty: Heuristics and Biases,” by Amos Tversky and Daniel Kahneman. And yet there’s compelling psychological research that shows how making the first offer can be a powerful advantage. Classic studies by Amos Tversky and Daniel Kahneman (and subsequently, many others) show that irrelevant numbers, even ridiculous ones, can significantly influence people’s judgments. For example, Tversky and Kahneman asked subjects to estimate what percentage of United Nations countries are from the continent of Africa. But before having people state their guess, the researchers would spin a special roulette wheel. Unbeknownst to them, the wheel was rigged to stop either at 10 or 65. Subjects who saw the wheel stop at the lower number estimated that 25 percent of UN countries were African. Those who saw it stop at the higher one, guessed 45 percent, almost twice as high. What’s interesting is that everyone who took part in the experiment understood rationally that a roulette wheel has no special wisdom when it comes to political geography. In fact, they were under the impression that the result of the spin of the wheel was random. Even so, it powerfully impacted people’s judgments. This anchoring effect, the establishment of a baseline quantity or entity (however arbitrary), has been demonstrated repeatedly in a wide range of experiments. Much less understood, however, are the underlying processes that explain these kinds of cognitive biases. Most disturbing are findings that show that knowing about anchoring does not immunize us from its effect. Expertise about valuation and markets may not help much either. Some years ago, David Lax, James Sebenius, and I did an experiment with general managers of a major sports league. We gave all of them a scenario about a talented player who was eligible to go on the open market as a free agent. We provided statistics about the player’s past performance, as well as a broader description of his personality and leadership. Everyone received the same background data except for one, seemingly minor item. Buried deep in the bio, the general managers were told that, on the way to the first negotiation, they happened to be listening to a talk radio show in which a fan was discussing the player in question. Half were told that if the team did not offer at least $2 million a year, they would surely lose the player. The other half were given a figure of $4 million annually. We wrote the scenario this way knowing that many managers are contemptuous of sports talk shows and for the uninformed opinions expressed on them. (We wanted to degrade the credibility of this information as much as we could.) Nevertheless, the managers who read about the caller’s higher figure were prepared to offer almost twice as much as those who saw the lower one. 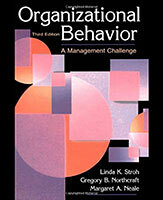 In Organizational Behavior, Northcraft, Neale and Stroh provide an overview of the challenges facing managers and employees in today's competitive organizations.. In their text, Organizational Behavior, Linda Stroh, Gregory Northcraft, and Margaret Neale describe a study comparing how professional real estate agents and inexperienced students appraised the value of a particular house. As with our experiment, virtually all the provided information was the same except for one item. Some people in each of the two groups saw a higher asking price, others saw a lower one. As it turned out, the higher anchor influenced the professional experts just as much as it did the amateur students. In simple, price-only transactions first offers shape people’s perceptions of how much potential room there is for agreement. Putting a stake in the ground sets one boundary. (Rarely will a buyer talk a seller up from the latter’s original demand, of course.) Experiments show a strong tendency for negotiators to split the difference between one party’s first offer and the other’s counter. This dynamic creates an incentive for making extreme demands; the more you ask, the more you may get. Let’s analyze a specific example. Say person X wants to sell their three-year-old car and posts an asking price of $16,900. An interested buyer takes a test drive and then makes a counteroffer of $13,500. After some discussion, they agree to split the difference and arrive at a price of $15,200. In a nearby city, person Y wants to sell their car, which is identical in every respect to the first one. But person Y asks $18,800. An interested buyer says that’s more than they can afford and offers $14,500—which is $4,000 less than person Y’s demand. After some negotiation they split the difference at $16,650. The second buyer may feel good about getting the seller to compromise, but because seller Y anchored higher than seller X, they received almost 10 percent more than did seller X. Research also shows a downside to anchoring high, however: The more you ask, the more likelihood there is of impasse. You may price yourself out of a deal if your counterpart takes your number seriously. And if they don’t, they may dig their heels in. At first blush that may seem nonsensical since the only reason for getting in line is to make copies. But perhaps providing an explanation serves a different purpose. It could be a social ritual, a respectful gesture of acknowledgement that a favor is being sought, and hence a reason should be given, even if it is not a good one. Even in seemingly simple transactions, more than price is often being negotiated. By asking a high amount as a seller (or offering only a little as a buyer), you are implicitly defining the negotiation as an arm’s length haggle or a contest. You may need (and deserve) favorable terms, but before insisting on them, consider how you can achieve your goal without compromising a relationship or triggering a belligerent response. So, what should you propose? Start your analysis by imagining a best-case scenario based on circumstances that are plausible, though not all that likely. For example, if you procure goods or services for your organization, what might prompt a vendor to agree to a bargain price? (An overstock of inventory, perhaps, or the need to meet quarterly targets.) Then prepare a credible rationale for your offer. You not only want people to agree to your number (or something close to it), but also to accept your underlying reasoning. This can require a balancing act. On the one hand, you want to be persuasive. On the other, you want to give yourself room to adjust downward if your best-case scenario proves unrealistic. 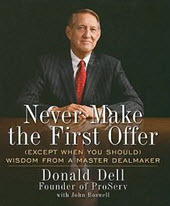 As the title of Donald Dell’s book suggests, whether you should make the first offer depends on the situation. Sometimes your counterpart may be much hungrier to make a deal than you ever thought. If so, like the Mississippi land owners who sold to the casino operators, you could be in for a windfall. But waiting has significant drawbacks. It empowers the other party to frame the negotiation, not simply in regard to a starting price but to the process itself. Will it be civil or contentious? Will it simply be a hard-ball exchange of offers and counters, or an explanation of reasonable criteria for a deal that will be acceptable to both sides? Think carefully about leaving it to others to make such choices. If you are forthcoming and put the first serious number on the table, you may occasionally miss getting even more than you would have dared to ask for. But by going first you can get the benefit of anchoring both what and how you’re negotiating. Over the long run, you may greatly increase the odds of reaching satisfactory agreements. Adam D. Galinsky, Should You Make the First Offer?, Harvard Business Review, July 1, 2004. Kandarp Mehta, Five Essential Strategies for Creative Negotiations, Harvard Business Review, December 15, 2012. Victoria Husted Medvec and Adam D. Galinsky, Putting More on the Table: How Making Multiple Offers Can Increase the Final Value of the Deal, Harvard Business Review, April 1, 2005. David A. Lax and James K. Sebenius, Anchoring the Big Picture, Harvard Business Review, November 1, 2004. Dina Gerdeman, Teaching the Deal, HBS Working Knowledge, July 30, 2014.